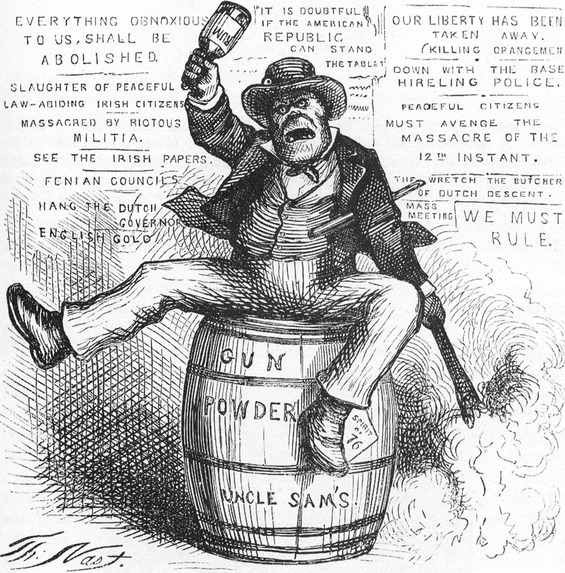 A bestial Irishman, his anger inflamed by pro-Irish political broadsides and "demon rum," represents a veritable powder keg of potential violence in this 1871 Thomas Nast cartoon. The ape-like features are typical of the depictions of the Irish used by Nast and other Anglo-American cartoonists, newspaper editors, writers, and opinion-makers, who were unsettled by the influx of Irish immigrants to the United States. The association of the Irish with violence, meanwhile, stemmed from the bloody legacy of a nationalist and peasant protest tradition in Ireland, as well as from fears aroused by events like the 1863 Draft Riots and the seeming Irish penchant for drunkenness and brawling. Source | Thomas Nast, "The Usual Irish Way of Doing Things," wood engraving, Harper's Weekly, 2 September 1871. Cite This document | Thomas Nast, “A Cartoonist Depicts "The Usual Irish Way of Doing Things",” HERB: Resources for Teachers, accessed April 20, 2019, https://herb.ashp.cuny.edu/items/show/640.